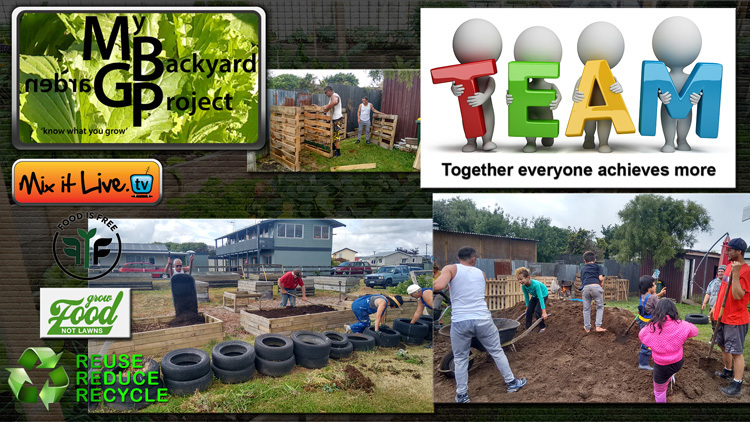 Come and TEAM garden build with us to prepare your backyard for 2017/18 spring - summer planting and ongoing harvests. This is a huge TEAM build and we hope all registered families can work with us to make this happen - thanks . A lot to read but jam packed with info to get us started and you guys off on the right track . 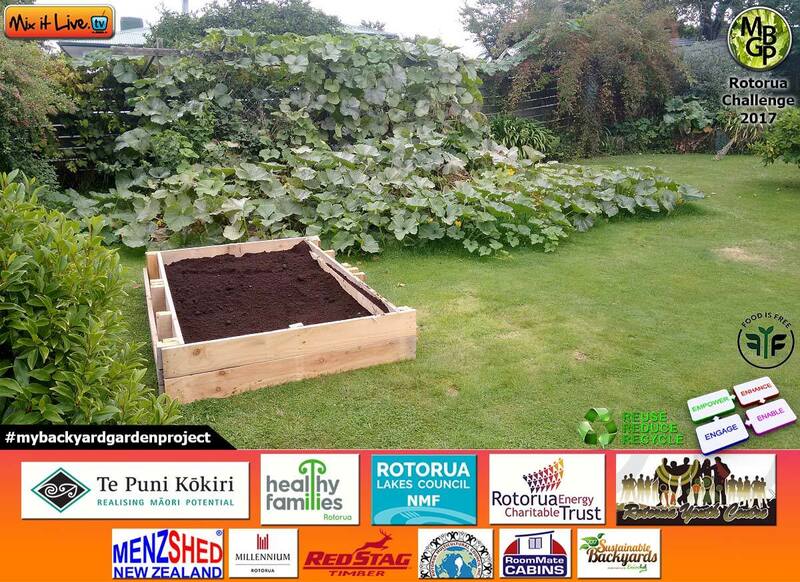 If growing healthy nutritious organic vegetables is something you want to time invest in with your growing family, then 50 - 100 families living in Swanson, Ranui, Henderson, Massey, and West Harbour have the opportunity to do so in this years MBGP Waitakere Challenge. 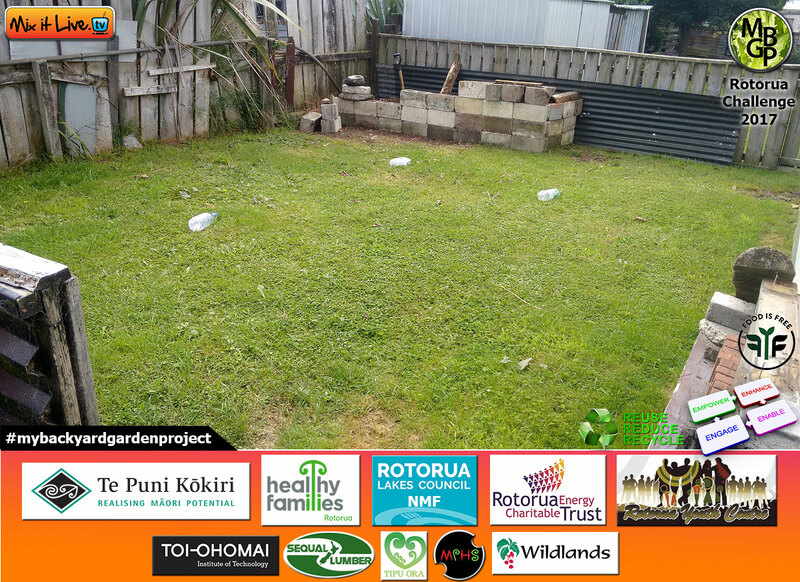 Back in March of this year we successfully teamed up with our Rotorua gardening friends and built 66 gardens in just over 1 week. Healthy Families Waitakere [Michele Eickstaedt - Nutritionist] provided some voluntary support helping out on Saturday with the last of our family builds. Very shortly after arrival home MBGP sat down with Healthy Families Waitakere and mapped out what we are sharing with you now. This exciting new format oozes challenge for families who want to connect with growing healthy vegetables from now on! 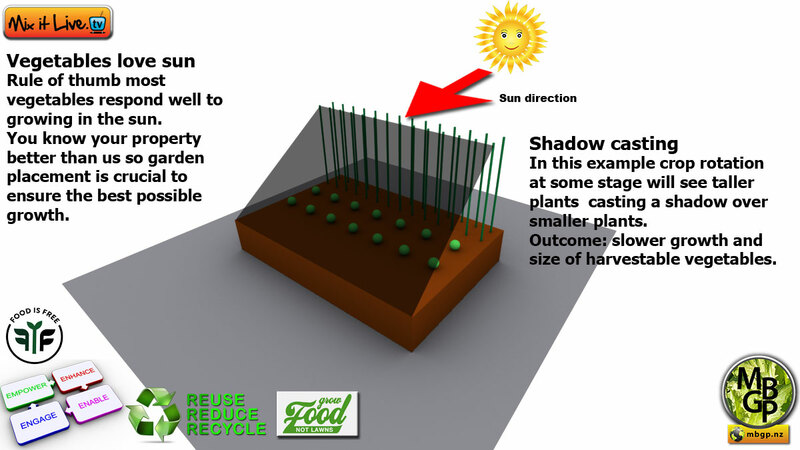 The goal in 1 week or less for MBGP WTC is to build and complete 100 FREE gardens, planted out by families and inclusive of a 2 bin compost system. Approximate price of completed garden $160 [don't forget you are getting them FREE]. Every registered family is an automatic 'team member' who will join our MBGP crew. 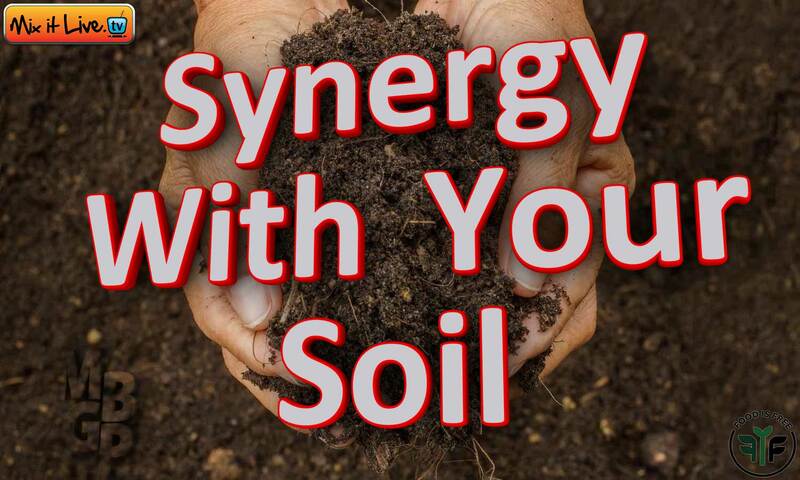 As a 'team member' you will get the opportunity of accelerated learning [knowledge and skill sharing] with compulsory protein packed workshops and contribute as best you can as in our BIG Team to fast forward the project with soil/compost and compost bin delivery - many hands make light work. MBGP is made up of a core group of volunteers who work incredibily hard serving the community. It is a passion to help others. We know that 'many hands make light work' and sincerly hope that registered families will learn and work with us with our workshops, delivery of soil, and compost bins. Days 1 & 2 - Thursday 6th - Friday 7th of July 2017 raised garden boxes will be delivered to all registered families. Raised gardens will be pegged and nailed in place ready for you to place your layers of old newspaper and cardboard in. One of the MBGP team members will call you one week out to confirm you still want your garden and inform what day we are going to be in your area subject to the interactive map we provide. See 'On the map' on the navbar above. Raised garden boxes will only be delivered and placed on these two days so your co-operation is required. You don't have to be there when we do this, its less than a 15 minute operation. We've found in the past if you leave milk bottles filled with water and placed on your lawn, this will inform us where to place your garden. 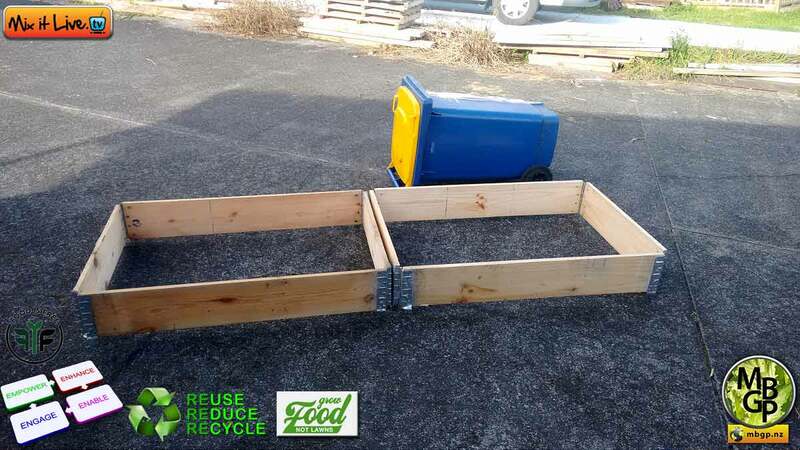 Click image below to view your 2 raised garden boxes to be delivered and pegged/nailed in place. Families please make sure this is doable for us. This step has to be done before topsoil is delivered. We won't be installing any gardens when topsoil delivery starts. Please let us know if you have dogs loose in the vicinity of where your garden is going that could offset our going onto your property. 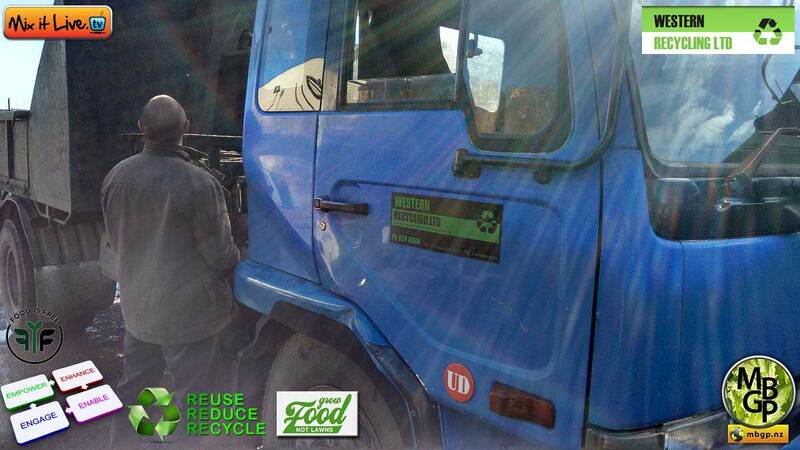 There is every possibility that a TEAM of volunteers will start delivering compost bins on Friday. 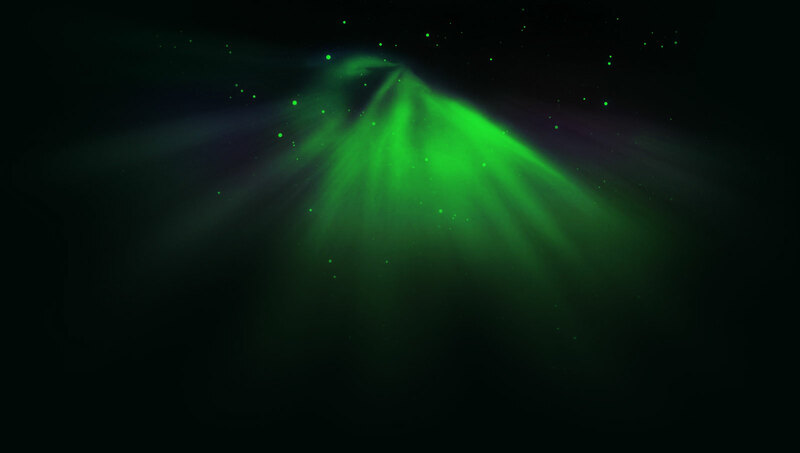 We will inform on Facebook if this is to be. Who attends: 1 x family member minimum from 50 registered families [or designated family member or friend]. Health & Safety: There will be a site induction for all attending. H&S in the workplace is something we are all responsible for. What to bring: Dress warmly with long pants, long sleeved clothing. Bring a coat just in case we have the odd shower. Boots or shoes to wear is compulsory for gardening. Book your spot: We will place 2 event ads on our Facebook Group page. Please book your spot so as not to miss out. Workshops: We request your presence to attend each of the great workshops explained below. Workshops are made up of presentations, demonstrations, and good ole kiwi attitude of 'giving it a go' with the main aim of empowerment through shared knowledge and skills. What you learn from our workshops you will be able to apply immediately in everyday life especially for your garden. It is super important to attend one of these 2 planned morning workshops. Despite all the good intentions of wanting a garden, if you show no interest in the educational/work aspects that we'll be covering then we'd rather see gardens go to families who will put in the effort to learn and work with us [TEAM]. Love Food Hate Waste presentation with Lucy Pierpoint. Jam packed with 'make sense information' and things to take home to put to good use. Each family will be issued with 2 x 40 litre bags of compost to take home to use as an activator or mix with your growing compound before planting. The Lasagna Garden Challenge is a new for this intake and is a successful form of gardening that has been around for many years. It has a tremendous waste minimisation theme. 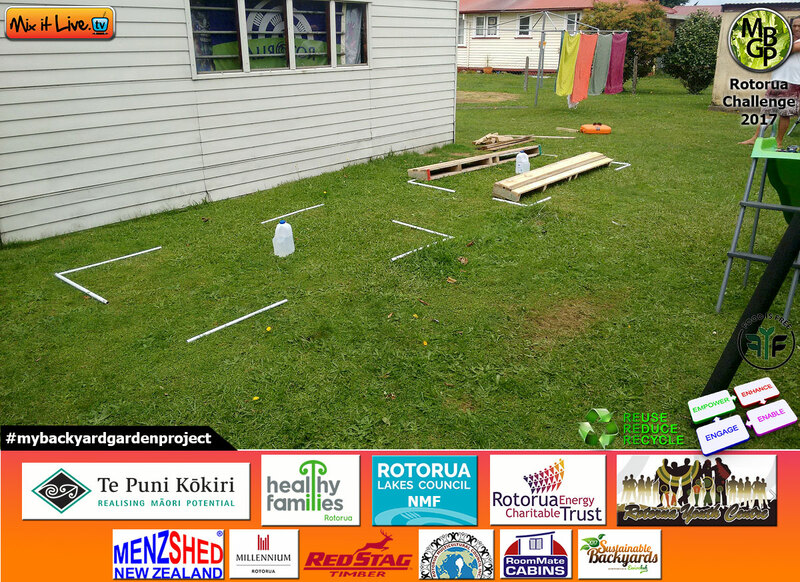 Please read more about Mitre10 MEGA Henderson Lasagna Garden Challenge via Challenges on the navbar above. Plant your seedlings demonstration with Buffie Mawhinney from Ranui Community Garden. Be prepared to get your hands a bit dirty  Each family takes home 2 punnets of Mitre10 Mega seedlings for their own garden. At workshop completion light refreshments will be available and opportunity to network. Please choose and book your spot below to attend. Where is Ranui or Massey Community Garden? When the workshops are being held a crew of volunteers will be out delivering topsoil and compost bins to families. The aim with 4 trailers, 3-4 volunteers per trailer is to fill 30-50 gardens per day. All families not attending a Saturday workshop are encouraged to help out with topsoil and compost bin delivery. This is repeated in kind when Saturday families help on Sunday with delivery duties. Not only are we following the 'many hands make light work' principle [TEAM] but we really want families/individuals to feel what it is like to contribute back to communities in a BIG positive way. 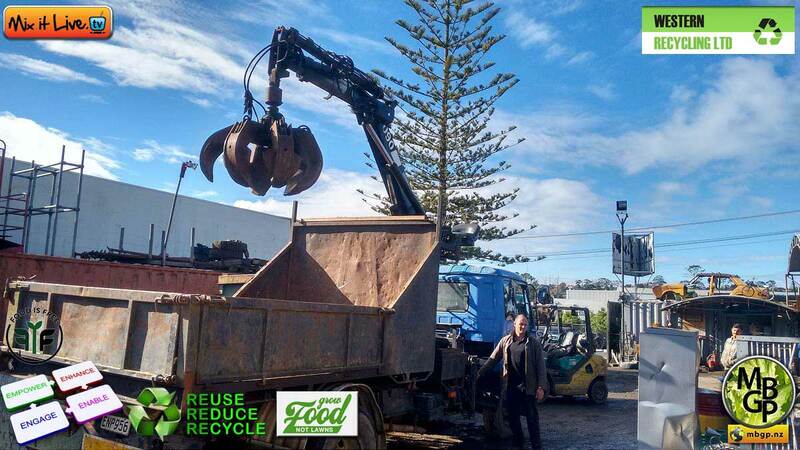 Great news for soil delivery: Bryan Hunter from Western Recycling on Bruce McLaren Road is providing 5m3 truck and driver for a day to help us out. Click images below to enlarge - thanks Bryan! Families please make sure that soil/compost delivery is doable for us. There will be NO special trips to accommodate if we place your garden either Thur-Fri and can't place soil from Saturday 10th June onwards when we are in your area as defined by our map. Momentum is key here and just because it is FREE, please don't abuse our combined community good will. What you will be receiving garden wise, where to place etc. Raised garden sizes will be approximately 1.2m long x 0.8 wide x 200mm. Each family receives 2 of these garden boxes. One garden box will be filled with topsoil/compost and the other garden box will be used for your Lasagna Garden Challenge. All families will receive 12 minimum seedlings to be planted. A 2 bin compost system is optional for all. We 100% recommend all families to get a 2 bin system. It will save you money in the long run. Organic nutrition is a vital component for your garden soil structure and the food scraps, lawn clippings, autumn leaves, cardboard/paper, coffee grounds, manures etc collected are super ingredients that work towards enhancing your soil. 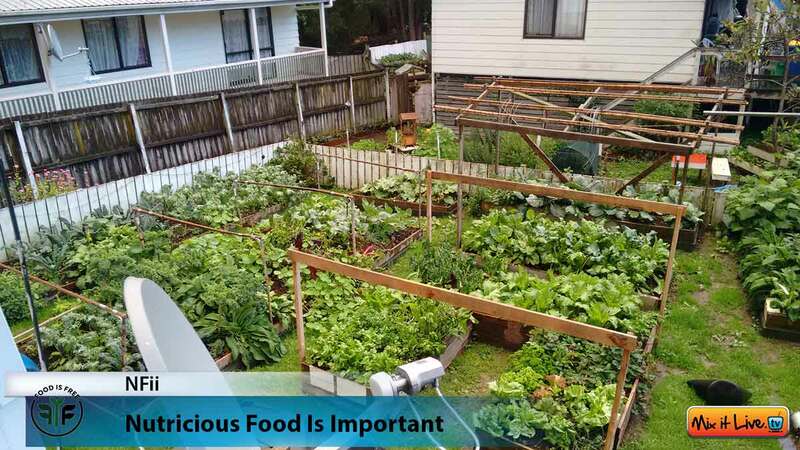 Families own their raised garden boxes and compost bins outright once placed. In the event that you move or are evicted it is the families responsibility to remove the above items if requested. Where to place your and compost bin? In a place that will get plenty of sun even if it is up against a fence. 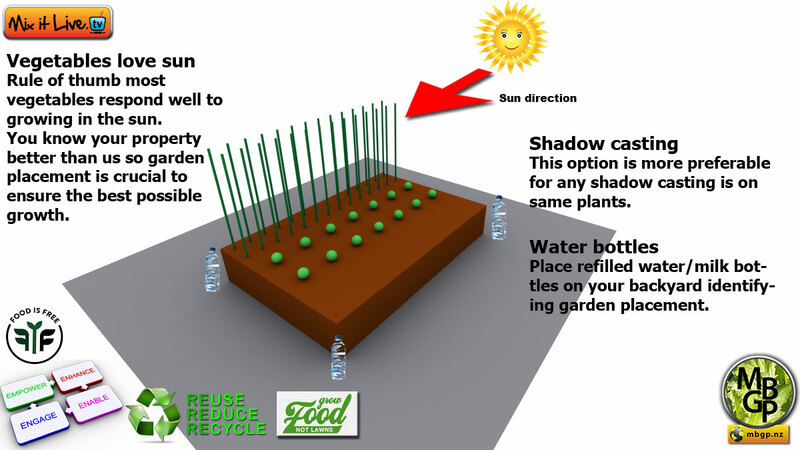 Please place 1 water filled bottle in your backyard where you want your compost bins placed. It would also be really great if you mow the grass as low as possible where your garden and compost bin will be placed before we come - thanks!! Subject to how many gardens are filled with topsoil/compost on the weekend, these 3 days have been catered for to finish. Day 8 - Saturday 15th July 2017. Shared celebration meal. With the hard work over, all of your seedlings planted, this is a perfect way to get together and celebrate what's been achieved. This is a warm invite to all families, volunteers, funders, sponsors to bring a plate and celebrate with us all. We know that this will be the start of a 'green thumbed journey for many'. One with which 'hand on heart benefits' your family with time continuum harvests from now on. What does NFii, SWYS and BGGF stand for? 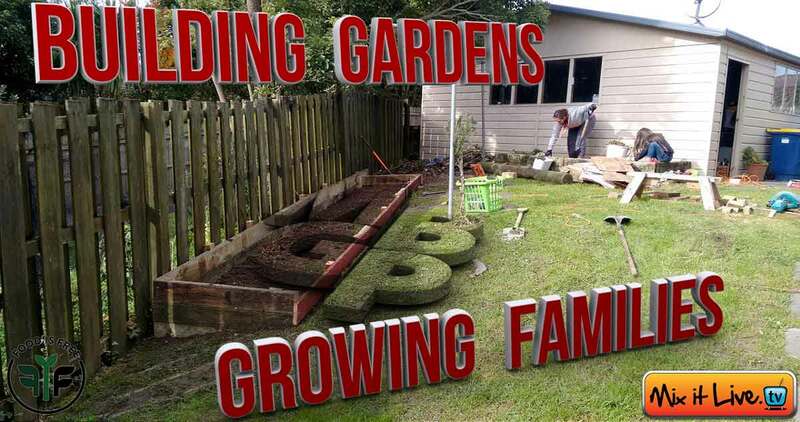 In context to what we are trying to achieve with building Rotorua family gardens each of the acronyms above work in partnership with each other. We'd love to repeat what we're doing in a few other cities like Hamilton and Tauranga so every little bit counts. Gardening is about networking with families and community and just doing it and making it happen! Like our gardens this website will change with content. We would like to thank these brands for their support.